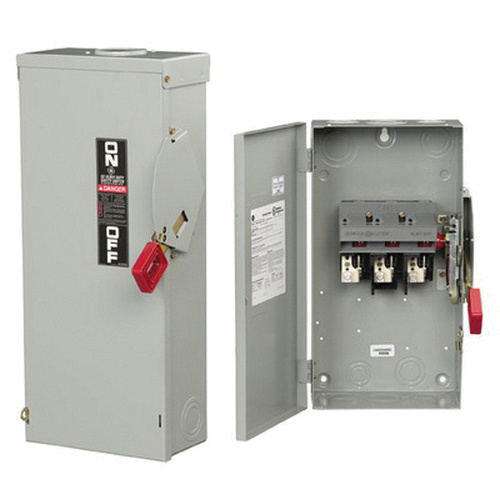 GE Industrial 1- or 3-Phase 3-Pole 4-Wire heavy duty safety switch has a voltage rating of 600-Volts and current rating of 30-Amps. It can accommodate 12-2-AWG wire for connection. It has a power rating of 20 hp at 600-Volts AC at 1-Phase and 5 hp at 250-Volts DC at 3-Phase. It features quick-make, quick-break mechanism. It is suitable for commercial and industrial applications where safety, high performance and continuity of service are essential. It is perfect for commercial and industrial applications. The safety switch meets UL and CSA 22.2 no. 4-04 standards.